Excel, Word, Outlook, Powerpoint on the desktop to start Microsoft Office 365 programs via the shortcuts under Windows 10! 1.) ... Creating the desktop shortcut for Excel, Word, Outlook, Powerpoint! 2.) ... Starting from the Quick Launch bar of the Window Taskbar Excel, Word, Outlook, Powerpoint! 3.) ... Attach Excel, Word, Outlook, Powerpoint to the taskbar, or start Windows 10! See also: ► change visual effects to best performance? 1.) Creating the desktop shortcut for Excel, Word, Outlook, Powerpoint! Now you can see all OFFICE-365 program links! (copy & paste or right mouse drag and drop)! (Image-1) Microsoft Office 365 Desktop shortcuts for Windows 10! 2.) 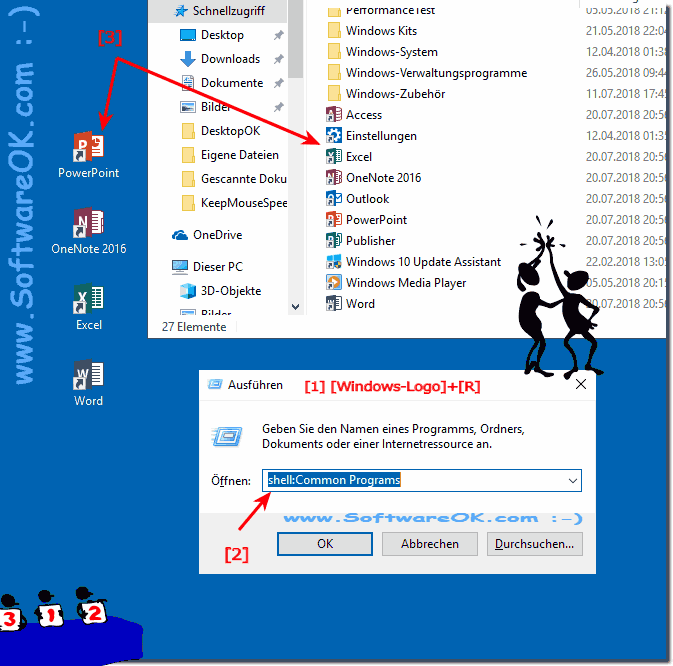 Starting from the Quick Launch bar of the Window Taskbar Excel, Word, Outlook, Powerpoint! 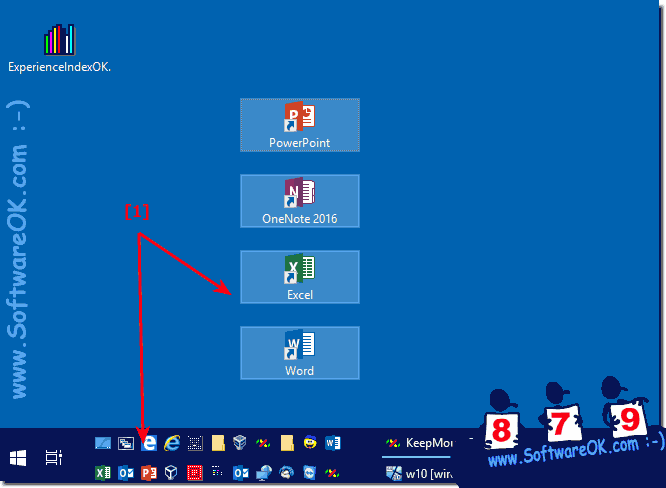 After you have created a desktop shortcut for Excel, Word, Outlook, PowerPoint , it is easy to make the Microsoft Office 365 programs available via the Quick Launch toolbar by simply dragging and dropping the Microsoft Office 365 programs desktop shortcut and dropping) on ​​the quick launch bar. ►►► Quick Launch in Toolbar for the Windows 10 Taskbar? (Image-2) Microsoft Office 365 Quick Launch Bar! 3.) Attach Excel, Word, Outlook, Powerpoint to the taskbar, or start Windows 10! If you would like to start Excel, Word, Outlook, Powerpoint via the Start menu in Windows 10, or from the desktop taskbar, you do not need to have much Windows expertise. With the Excel, Word, Outlook, Powerpoint Desktop shortcut you also have the option to make the Microsoft Office 365 programs even more accessible. 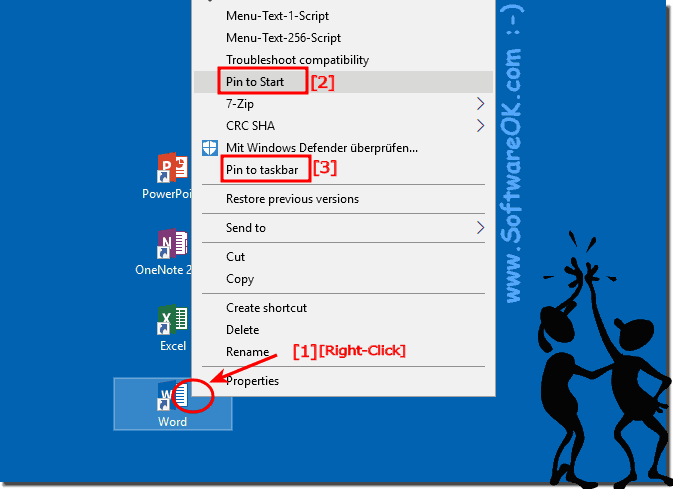 Simply right-click on the desktop shortcut and attach to Start and the taskbar! This solution / example is handy for anyone who often works with Excel, Word, Outlook on Windows 10, here's how to create a shortcut to these important Microsoft Office 365 programs. Especially with Microsoft Windows Tablets, pinning to Windows Start is a handy thing when working in tablet mode, (eg on the Ms Surface Pro a fine thing).